Saturday, April 13, 2019 – 8 A.M. TO 12 P.M. 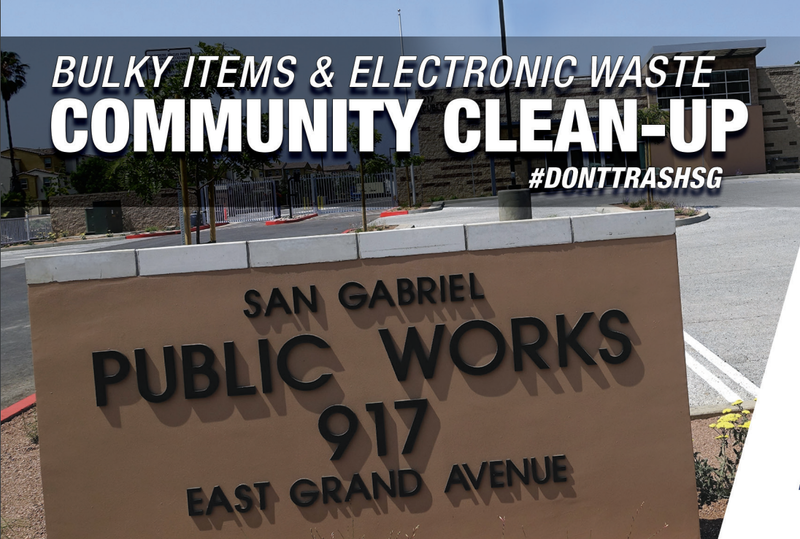 Proud to Provide Recycling & Solid Waste Services in the City of San Gabriel. Citywide spring cleaning yard sale April 6-7! Bring your leftover unwanted bulky items and e-waste to this Clean-Up Day the following Saturday on April 13! The City of San Gabriel’s Neighborhood Improvement Services Division is dedicated to maintaining a clean and safe city. Please help us keep San Gabriel clean and schedule all bulky item pickups by visiting www.AthensServices.com/bulky-item-pickup or by calling (888) 336-6100. Schedule two (2) FREE bulky item pick-ups a week, and $25 per additional item. Schedule two (2) FREE e-waste pick-ups a year, and $25 per additional item. DUMPING IS ILLEGAL. Violators can be fined $1,000 and be referred to prosecution for further legal action.